The past weekend saw our first return to the Trout Hotel in Cockermouth, Cumbria since the floods in November 2009. Supported by AAPGAI for a number of years we were delighted to be able to return to this hotel on the River Derwent to hold our Spring Assessment and Public Open Day Weekend in March. With the hotel now fully restored we couldn’t have picked a better weekend, almost cloud free bright blue skies, very little wind and a glowing sun gave our candidates almost perfect conditions with which to conduct their Provisional, Advanced and Master level assessments. THE ASSESSMENTS: Special congratulations to some of our successful candidates: Bert Schaaf, John Young, Trevor Hayman and Martyn Armstrong. Trevor is our first candidate to come through the Weekend Instructor Initiatives first introduced by AAPGAI in 2010. (Above left) Bert Schaaf an Advanced Salmon Instructor had driven all the way from Germany, and (Above right) Trevor Hayman are both applauded for successfully passing their Trout Provisional Assessment. AAPGAI Chairman Illtyd Griffiths presents them with their awards. (Above left) Illtyd congratulates a ghostly John Young on passing his Advanced Trout and (Above right) Martyn Armstrong who passed the very demanding Trout Masters Level Assessment… Congratulations. THE OPEN DAY: Following the completion of the assessments, we were joined on Saturday by a host of future instructors & keen anglers to enjoy a packed programme of demonstrations and 1-2-1 fly casting & fishing. After introductions by Gary Champion it was up to Ian May to get things rolling. They looked at fishing chalk streams & rivers concentrating on presentation casts and stealth like approaches when fishing from the bank as opposed to wading. Martyn goes one better – knees’y does it. Paul & Mike extolled the virtues and uses of the Double Spey and the Snake Roll with spey lines, shooting heads and single handed rods – Guess who drew the short straw? 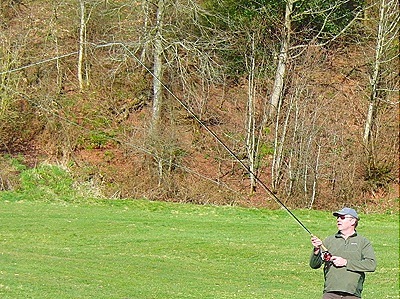 Paul launches the forward stroke from a Double Spey layout… and launch it stayed! Twas’ Vic who concluded the morning sessions leading into lunch… arranged on river it gave all the attending visitors the opportunity to either pick up one of the plethora of rods, reels and lines available, have a cast, a chat, or just relax and munch the delights provide by the Trout Hotel… sticky bun anyone? Moving on and re-energised it was into the afternoon session and Lee Cummings. This was utterly mind blowing, in layman’s terms Lee demonstrated distance casting techniques, why & where they can be useful, set ups for general fishing distances such as big reservoirs or techniques for those that perhaps have aspirations for the competitive arena. A bit of simulating required with the Derwents water at summer level and shallow.